in the state of Kerala. Renowned as the finest beach resort in the world, Kovalam is quite popular among western tourist as the beach has shallow water, low tidal waves, flourishing shoreline and offers all the exquisite facilities to make the beach holiday, remarkable, enjoyable and memorable. Kovalam ranks on the top of the list of beautiful beaches in Kerala and more of all; it is very near to the capital city Trivandrum, which has helped to flourish in tourism with maximum number of tourists visit from across the world. It is not only known for sun-kissed shoreline fringed beautifully by the swaying palm and beach resorts, but there are pretty good number of tourist places which are also worth to pay visit while on a trip. It is a popular beach in Kovalam which has sandy silver coastline beautifully fringed by the swaying coconut and palm trees. The pleasant and charming shoreline is sure to captivate visitors with its rhythmic tune of the waves and the various water activities that it offers. Visitors to this beach can have unlimited fun and enjoyment and have the taste of adrenaline running water sports activities like para-cycling, paragliding and swimming. It is a place must visit while in Kovalam. Hawa Beach is the most popular among all the beaches in Kovalam and is beautifully adorned with palm grooves. Though it is not crowded with tourists it is still an ideal place to enjoy sunbathing and surfing relaxing along the tranquil atmosphere of Hawa Beach. Samudra beach is yet another popular beach near Kovalam which is also considered to be a scenic jewel, located towards the northernmost region of the beach Kovalam. An absolute paradise for newly wed couples, Samudra is famous for its virgin and unspoilt coastline, tranquility and the serenity it offer to the visitors. Here one can enjoy the picturesque sight of the nature as well as the squashing waves with the hard rocks. 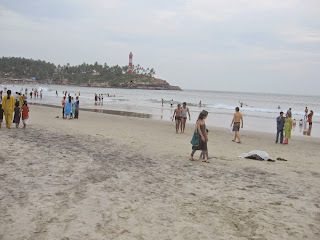 It is an ideal beach destination in Kovalam to spend leisure beach holidays in Kerala. It is an important tourist spot located at the distance of 3 kms from Thiruvananthapuram and an hour drive from Kovalam. Veli Lagoon which is separated by narrow sand bar is a popular picnic spot and has fish ponds, wading pools and landscape gardens with facilities of boating and water sports. It is an interesting place to enjoy quality time appreciating the art works and the wide collection of artifacts that are usually of ancient times related to Sanskrit civilization. The Art Gallery is visited by good number of tourists, especially from Europe. Located on the banks of the River Karamana, Aruvikkara Dam is a tourist spots must visit while in Kovalam. It is quite popular among tourist for its reservoir, garden and the ancient Bhagirathi Temple dedicated to Goddess Durga. Beside these important tourist places, Kovalam has many other places which are worth to pay visit while here for holidays. Plan your trip to this world renowned beach resort and soak in the beauty of the beach holidays exploring these exciting places which has exquisite attractiveness and charm to captivate you.